One of the great advantages of a big tower is that it is downright trivial to put up simple wire antennas that perform well. 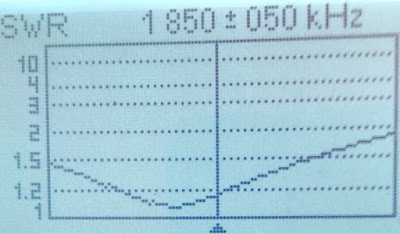 I have now built the 160 meter T-top vertical I modelled earlier, tuned it and put it on the air. It works great for a temporary antenna. Next year I'll roll up the radials and store the antenna during haying season. Choosing a permanent high-performance 160 meter antenna is not a priority for this year or next. I hope to get to it eventually. 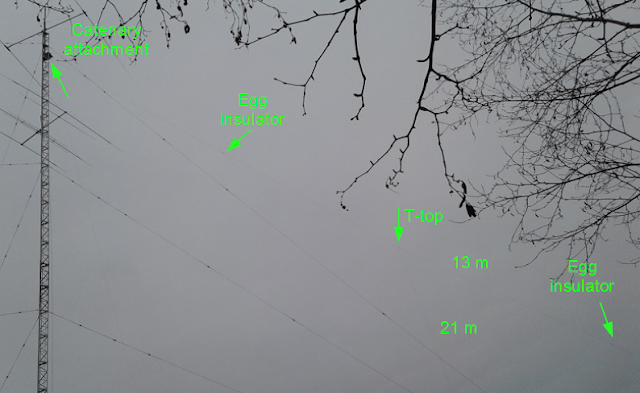 The picture of the upper part of the antenna is annotated since it is otherwise difficult to see the 14 AWG wires. With radials attached it resonates at 1.750 MHz. This is 80 kHz lower than in the model, or 4.5%. That's a lot! Using percentage is helpful since a few kHz of error is deceptively small at low frequencies. Perhaps there is more coupling to the tower or guy segments that the model dealt with, or perhaps the ground differs markedly that what is in the model or that NEC2 can accurately calculate. 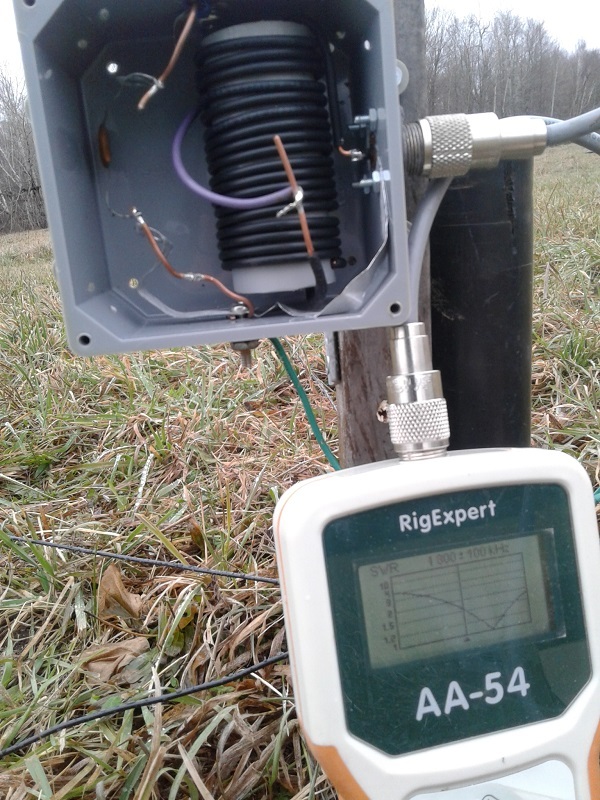 For a single element antenna of this type the error is not critical -- there is no F/B or main lobe to optimize -- so I trimmed the 22 meter vertical wire down to the designed 21.5 meters and compensated the rest with an L-network. The L-network is required in any case due to the low radiation resistance. Low radiation resistance is a feature not a bug, as we'll see. I did not follow my original design exactly. The biggest change was to reduce the radial count from 16 to 8. For a temporary antenna I did not want to take more trouble than absolutely necessary to get an acceptable signal. The radials are as designed: 30 meters long. It only makes sense to go with longer radials -- λ/4 or more -- for a far greater number of radials. Since the AWG 18 wire spools I ordered contain 150 meters of wire there are exactly 5 radials on each spool. I was surprised there was no overage on the spools. When I added short tails for wrapping the ends the fifth radial came up short 50 cm. It seems when you buy 150 meters of copper these days that's exactly what you get. The catenary is tied off a couple of meters lower than the design to avoid crossing the prop pitch motor mount. This does not effect performance or the length of the vertical wire. All it does is move the ground anchor further out away. I swung the antenna to be SSW of the tower rather than SW. The model shows that this change increases gain towards Europe (NE) almost 1 db. However it places the antenna wires, especially the T-top wires closer to the guys. As speculated above this may have caused the change in tuning. 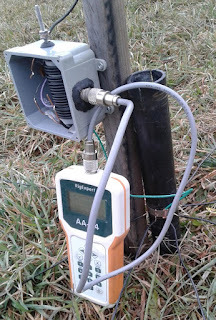 I did make sure to model the antenna wire as insulated -- which would lower the resonant frequency, as it measures in practice -- so that is not the cause of the difference. I planted a copper ground rod where the vertical wire hangs for easy radial attachment, wrapping the radial ends around a stainless hose clamp that holds them tight to the ground rod. After the first 4 radials were laid I measured the impedance. This brought a surprise. The radiation resistance was almost 10 Ω higher than expected. Can you see why? Suspecting the cause I returned to the computer to play with my EZNEC model. 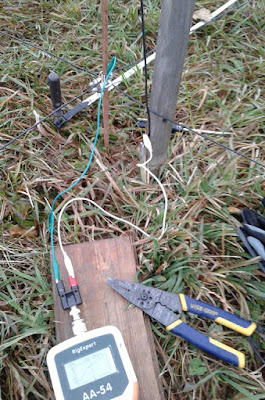 I added a direct connection to the MININEC ground through a resistance load representing a rough guess at the impedance of the ground connection through the ground rod. Sure enough the radiation resistance rose from 24 Ω to almost 33 Ω. The purpose of the radials is to provide a low loss return path for the near field of the antenna and to keep those fields from circulating through the lossy ground. The ground rod routes a portion of the current directly via the ground. It's self defeating. For my final design I replaced the ground rod with a short length of ABS pipe. The radials are attached in the same way. The difference is that the radials are now isolated from ground. Measuring again, the radiation resistance dropped to 27 Ω at resonance. This is a significant improvement. Keep in mind we are trying to improve antenna efficiency, not add so much loss that there is a direct match to 50 Ω transmission lone. As I said above, a low radiation resistance is a good thing to see. The match comes later, in this case one day later. Once I had all the radials attached and the antenna tuned as much as possible without shortening the T-top I measured the impedance at 1.830 MHz, the centre of my CW contest and DX band segment, I sat down at the computer and designed the L-network. With modern software this is trivially easy. I used TLW to do this, as I have had good success with it for other antennas. The 31 Ω resistance is several ohms higher than at the 1.750 MHz resonant frequency. Radiation resistance tends upward above resonance. Neither is the reactance a surprise since the antenna is long at 1.830 MHz. As you can see the feed point SWR is quite high primarily due to that inductive reactance. I chose a "low pass" style of L-network since it offers modest attenuation of harmonics which could cause problems in a multi-op or SO2R contest setup; this is handy right now since I don't yet have band pass or notch filters. Experience tells me this is tolerable for 100 watts. Another benefit is that the coil size with this style of network is usually small. 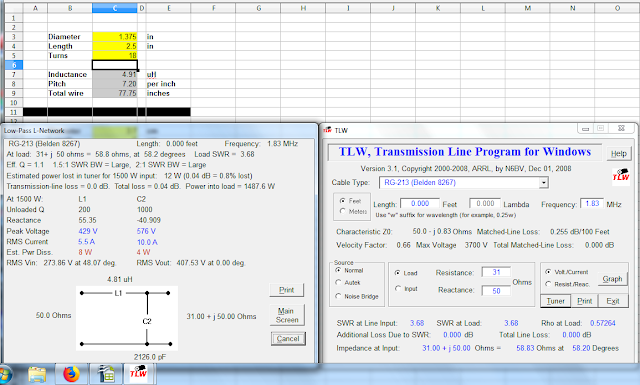 I reused the L-network from the 80 meter tower vertical I had at my Ottawa QTH. I wound a new coil from insulated AWG 14 solid copper (bought in bulk) on a scrap piece of 1" PVC pipe (~1.3" OD). The wire's insulation makes the coil diameter slightly larger than the form. For a capacitor I used a high voltage 2,200 pf disk ceramic. All the door knob capacitors I have are no more than 500 pf and if I add them in parallel there is no room for them in the small enclosure. The ESR of the chosen capacitor is probably not very low but based on the network design the power dissipation should be low when running my rig at maximum power of 200 watts. Next year I'll revisit this, or sooner if the capacitor fails. 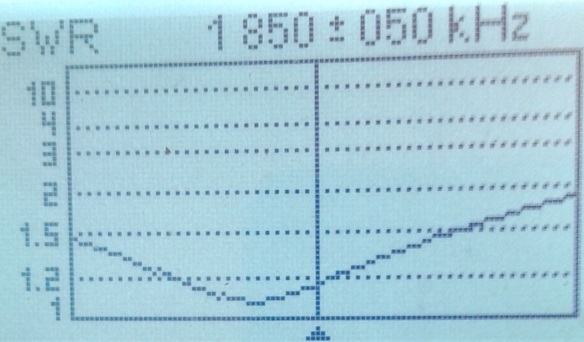 Notice the SWR curve above. A computer, an hour in the workshop and a trip out to the field and the SWR is perfect. No further adjustment needed for an SWR of 1.0 at 1.840 MHz and a 2.0 SWR bandwidth of 100 kHz. I displayed my confidence up front by using fixed C and L components. I had planned to leave it be for a couple of days to haul Heliax across the field and up the tower to get the other antennas connected. Then the weather closed in with freezing drizzle making the towers unapproachable. Instead I grabbed my newly connectorized rolls of LMR400 and a couple of UHF barrel connectors and made a 260' (80 m) run directly to the shack. Cable splices were propped up on spent wooden cable reels and tightly wrapped with plastic bags for temporary weatherproofing. In the shack the SWR remained excellent. The bandwidth improved slightly, probably due to loss in the ancient bit of RG213 I grabbed to span the last 10 meters to the feed point. Then I waited for the sun to set. There were a couple of European contests going on and I could hear them well on the northeast Beverage. On receive the vertical is of course far noisier. Even so many of the Europeans could still be heard well on the vertical, and not very well on the 40 meter inverted vee. My initial hypothesis is that the vertical is achieving lower radiation angles that allow it to hear DX better than the noise increase would suggest. In other directions the impact was stark. My first QSO was TO2SP in the Caribbean, who was loud on the vertical. On the northeast Beverage his signal was almost unreadable. I had a similar result with US stations who were well over S9 on the vertical and extremely attenuated on the Beverage. The second night I worked J5T and pushed through a couple of small pile ups. That bodes well. On a few DX stations far to the south they copied my 200 watts better than I copied them. That could pose a problem. Towards Europe and the Middle East I could copy signals quite well on the Beverage while they heard me not at all. It's a combination of not having an amplifier and, perhaps, poor receiving conditions on the other end. Need...more...Beverages. But that's a winter project, not for now when more important antenna projects beckon. For the present I am very appreciative for what I have on 160 meters. I may have to move the radials this week for the remaining work on the tower. 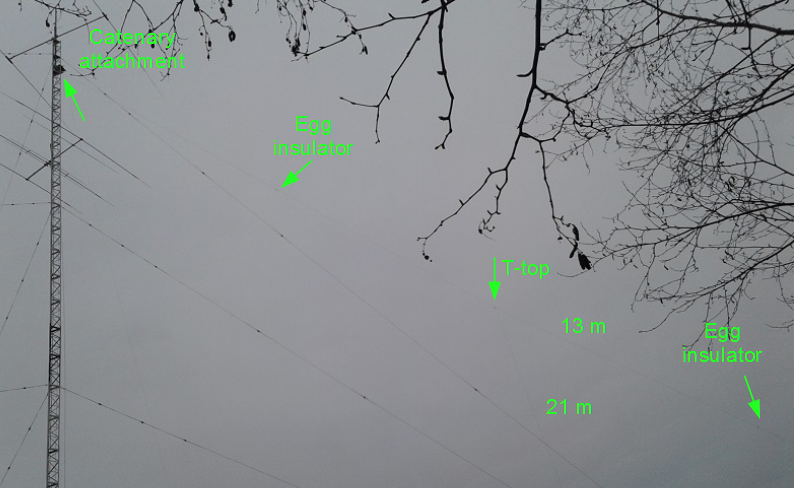 Since the antenna is only 20 meters from the big tower and the radials are 30 meters long there are many opportunities for accidents. I know where the wires are yet I have a habit of stepping on them. Others don't have even that foreknowledge. In any case the LMR400 runs are needed for the two runs from the shack to the 8x2 switch I've installed away from the house (more on this in a future article). I can live without the 160 meter antenna for a couple of days. It's only real purpose for the next few days is to become familiar with how it performs and identify its capabilities on the air and any grievous deficiencies. Once I've installed the intended 200' (60 m) coax to the switch box I'll weatherproof everything and leave it be for the winter. The next few weeks will tell me whether this antenna can deliver the results I want. First up is the CQ WW CW contest and then the ARRL 160 meter contest. I have high hopes for this, my first real antenna ever for top band. There are many things you can do on 50 acres that you cannot do on a suburban lot.